A weird, one-day break from the cold, fully forecast a few days back, that came to pass. It was a little milder yesterday, and this morning, the temperature jumped, hitting somewhere around 10°C (50°F). 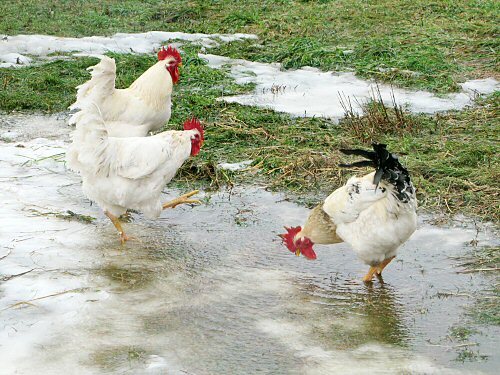 Pretty tricky trying to walk around on the treacherous wet ice, but the chickens seemed to love it, charging right in! And then, by late afternoon, the heat was gone. Personally, I choose warmth, even for a few slippery hours…! That first photo is so picture perfect! Your chicken pictures are simply the best! It amazes me how hardy the little creatures are. I still say you were a pro photographer in your former life!!! 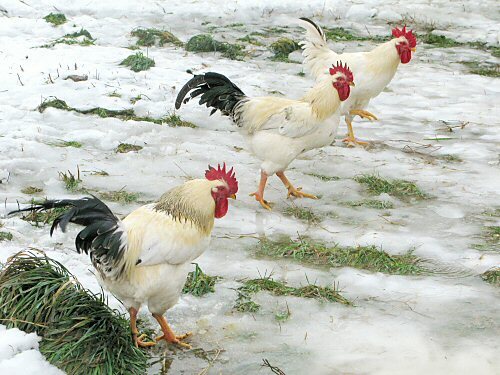 Fabulous pic of chickens all lined up.